other collectors to do the same! Our hobby needs a few more Billy Neills. Billy has created an inspiring tribute to his favorite team, “Astros A to Z.” He’s letting the world watch his collection grow through the work-in-progress website. Best of all, he’s showing other collectors that taking a moment to be grateful for an autograph will help fellow collectors. I was grateful that Billy took time to share his hobby history with BBTL readers. 1. Are you in or near Houston? How about Texas? How long have you liked the Astros? I was born and raised in Louisiana. My grandfather used to take me to watch the Shreveport Captains. My earliest memories of baseball are from that time. My grandfather would point out things on the field and explaining how the game is played. A lot of my opinions on baseball come from this point in my life. So to actually answer the question, I used to seek out baseball. I would watch the Braves on TBS and the Cubs on WGN. And both of them played against this crazy team with these ridiculous orange uniforms. I sought out games with the Astros and their crazy uniforms. As an adult, the love of that team followed along with me. I lived in Dallas for five years, but could never enjoy an AL team as much as an NL team. I have Astros running through my blood. 2. How long have you been collecting Astros autographs? How big is the collection and what does it include? The autograph project stemmed from having just too much stuff. I am a member of the Team Collectors (www.nimster.com/TCForum) and have ridiculous amounts of Astros stuff. So in order to help control the billion-headed monster, I decided to focus. I made that focus autographs. So starting around 2008, I pulled out all of the autographs I already had and set the rules for my collection. To be included in my collection it must be an item that either features the player in an Astros uniform, in a minor league team uniform that does not have clear team affiliation (Iowa Cubs would not qualify but Hickory Crawdads would), or items with no team affiliation (index cards, baseballs). As of today, I have 464 unique player autographs out of 750 all-time Astros. 3. How many TTM? How many in person? Roughly half of my collection was obtained TTM. Probably around 10% was obtained in-person, though mostly by other collectors. I would help people with players for the Rangers in return for help with Astros. 4. What do you send in an autograph request? How have the Astros been in signing c/o team (or spring training)? My autograph requests are fairly standard. I send one or two cards with each request. I have sent custom index cards to players that do not have Astros cards, which I will give you an example of in one of the later questions. The Astros signing habits mirror that of most teams. Middle relievers and closers sign without fail. Lower tier players tend to sign and the stars tend not to sign. 5. Did you ever try for ‘graphs at the Astrodome dome, before or after games? What was that like? No, when I was that young I never really considered doing anything other than watching the game. By the time I was old enough to be asking for autographs, the Astros had moved to Minute Maid Park. 6. Do you tell in letters that you’re trying for “Astros A to Z”? Reactions for your goal from current or ex-players? At first I did not mention the project. In the last year, I have started including the URL for the project website. Some players just sign the card and do not mention it. Other players have wished me good luck in my project. 7. Have you asked specific questions of ex-Astros? Example of a great tale sent in return? Yes. I have asked questions of Kip Gross, CJ Nitkowski, and Rob Mallicoat. One of my favorite returns was from Bruce Von Hoff. 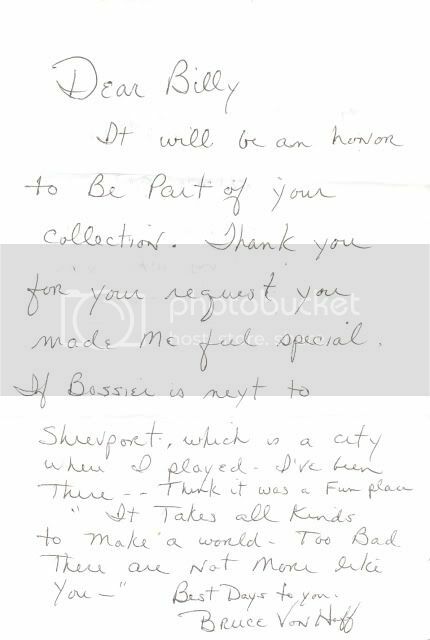 He sent me a wonderful letter thanking me for including him in the project and briefly discussed the Shreveport Captains. I will provide an image of the letter below. 8. Have you learned about the Colt .45s from ex-players? (A couple have loved telling about the first-year mosquitos!). Most of the players that have been responsive to questions are early Astros players. Very few of the original Colt .45s have answered questions beyond very basic things. I have read quite a bit about the original team and what led to the move from Colt Stadium and how unbelievably terrible it was to play there. 9. I got Astros postcard-sized photos from the team free for years. How many of these have been included as bonuses in your autograph requests? A few players send these. The two that immediately come to mind are Johnny Edwards and Dooley Womack. Johnny Edwards is one of those amazing guys that spoils his fans. 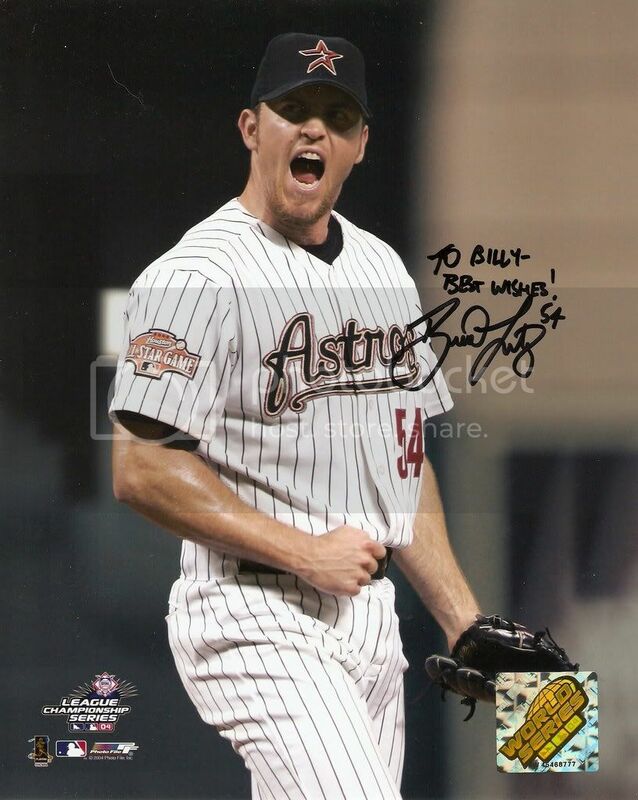 Dooley Womack sent it because I did not have anything with him in an Astros uniform. Many players are more than happy to help out a collection but you have to be polite and respectful. 10. I love you encouraging thank-yous to Johnny Edwards. 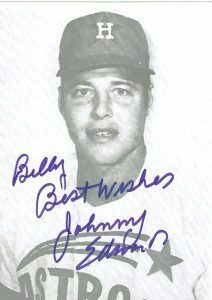 [Billy gave away a Yogi Berra autograph through his site to get more collectors writing their thanks to Edwards.] Do you have an example of a reply for a thank-you note? Thank you very much for taking the time to respond to my request and for adding the extra items. The effort you put into answering your fans does not go unnoticed. Your contributions both to the game as a player and as a representative of MLB are greatly appreciated. Thank you notes do not need to be literary masterpieces. They just need to be appreciative. It costs one stamp and can really make an impression on a player that is teeter-tottering about the value of answering fan mail.tottering about the value of answering fan mail.tottering about the value of answering fan mail.tottering about the value of answering fan mail.tottering about the value of answering fan mail.tottering about the value of answering fan mail.tottering about the value of answering fan mail.tottering about the value of answering fan mail.tottering about the value of answering fan mail. 11. Future autograph hobby goals? I also collect literary autographs. But it is a secondary project for me. 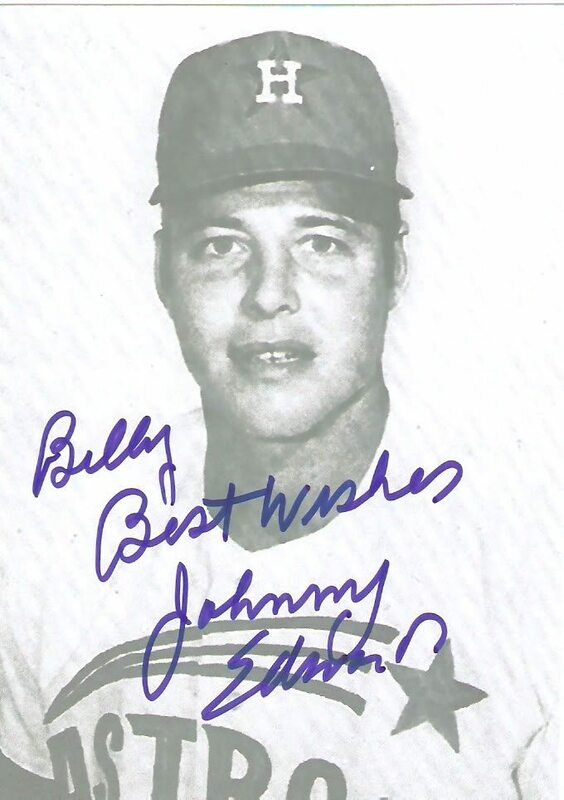 As for goals with the Astros A to Z Autograph Project, my biggest goal is to obtain a Jay Dahl autograph. He is possibly one of the rarest autographs in baseball. He appeared in one game during the All-Rookie Game and was sent back to the minors where he died in a car accident. He was only 19 years old. It is quite a sad story. My short term goal is to hit the 500 autograph mark by the end of the year. The MOST meaningful autograph is tough! I’ll go with a fairly common autograph but a fellow collector surprised me with it. Anyone that has ever been a member of Beckett or now FCB knows Scottopotamus. He asked me for my address and this showed up in the mail. He had gotten three autographs directly from Brad Lidge in a trade for an old tobacco card. Lidge agreed to sign three photos in addition to the trade. Scott had one of them done for me. 13. Advice for new team collectors? Focus. It is tempting to buy every cool item you find. But few of us have the space or resources to have everything we want. By focusing on one aspect, you make an attainable goal. Collect game used items, Topps cards, or autographs. Whatever aspect you find most interesting. Coming Monday: Love the Cubs? Former Cub outfielder Bob Addis may feel differently. I have a Jay Dahl signature from a contract he signed. Yes, it is rare.